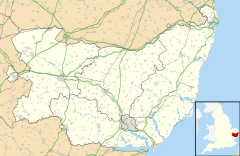 Hadleigh (/ˈhædli/) is an ancient market town and civil parish in South Suffolk, East Anglia, situated, next to the River Brett, between the larger towns of Sudbury and Ipswich. It had a population of 8,253 at the 2011 census. The headquarters of Babergh District Council were located in the town until 2017. Spelt Hadlega, R.B. ; Hadleigh, Ipm. ; Hædleage, in a late chapter, Thorpe, Diplomat, 527; Headlega, Annals of St Neot, quoted in Plummer's ed. of the A.S.Chronicle, ii. 102; Hetlega, D.B., p.184. In D.B. the t stands for th; and the true A.S. form appears in a Worcs. charter, dated 849, as hæðleage(gen.) with reference to Headley Heath (a tautological name) in Birch, C.S. ii. 40; see Duignan, Placenames of Worcs. The sense is 'heath-lea.' In a similar way the A.S. ð has become t in Hatfield (Herts.) which means 'heath-field'. Guthrum, King of the Danes, is said to be buried in the grounds of St Mary's Church in the town. He was defeated by King Alfred at the battle of Edington in 878. The first documented lord of the manor was ealdorman Byrhtnoth, who was killed at the Battle of Maldon in 991, when Anglo-Saxon forces tried to repel Viking invaders. Ealdorman was the highest rank of noble and just before his death he was the most senior ealdorman in the country to King Aelthelred. Byrhtnoth and his wife had no children, and "so he bequeathed his many lands to churches or religious institutions around the country". Hadleigh received its market charter in 1252 and had a grammar school by 1275. The manor of Hadleigh, along with those of Lawling in Essex and Monks Eleigh in Suffolk, were among those given to the Priory Church of Canterbury Cathedral. It made Hadleigh an "archiepiscopal peculiar" – under the direct control of the Archbishop of Canterbury. Hadleigh was a moderately-sized town, with a reckoned population of about 1,100 or 1,200 in 1306. At that time there were 118 "unfree tenants" in 1306 and 75 "free tenants." They had to pay rent, provide labour services The manor had 2,000 acres (810 ha). The manor was a working farm, with crops and some animals, and had quite an important dairy. Hadleigh Hall was the site of the medieval manor house, in 4 acres (1.6 ha). It has been suggested by Woods (2018) that Walter "Wat" Tyler and his wife were Hadleigh tenants about 20 years before he was one of the leaders of the 1381 Peasants' Revolt. Records show a Wat Tyler taking over a freeholding in Coram Street in 1358/59 and it is possible he worked as a tiler. In 1438 administration was passed from manorial control to trustees. The market was eventually sold to Babergh District Council in the late 20th century. Hadleigh was one of the East Anglian towns that derived its prosperity from its wool and cloth industries. It has a 15th-century timber-framed Guildhall and many fine examples of timber and brick listed buildings, some with highly detailed 17th century plasterwork or "pargeting". Most of these buildings can be found in the High Street, Angel Street, Benton Street and the immediately surrounding area. The town has a total of 246 listed buildings. Of these, four are Grade I listed: the grouping of St Mary’s Church, the Deanery Tower and the Guildhall; and the Coffee Tavern in the High Street. Twenty-seven are II*. One hall house has been dated to 1380-1420. The Georgian East House, on George Street, is designated a Grade II* listed building. In March 2013 plans by Babergh District Council to redevelop the site and build houses on the land behind were withdrawn after strong local protest. The property was once used for a range of community events and activities. Opponents of the plan had argued that the adjacent land had been used as a village green for the previous 20 years. The building was renovated as a private home in 2018. Originating in the 14th century, the Grade II* listed Toppesfield Bridge, over the River Brett, is the oldest in the county still carrying vehicles. It was widened in 1812. The Anglican church of St Mary the Virgin is an active parish church in the archdeaconry of Ipswich in the Diocese of St Edmundsbury and Ipswich. Its earliest parts date from medieval times. On 26 April 1950 the church was designated a Grade I listed building by English Heritage. The Grade I designation is the highest of the three grades and is for buildings that are "of exceptional interest, sometimes considered to be internationally important." According to the Annals of St Neots, a chronicle compiled in Bury St Edmunds, king Guthrum (later called Æthelstan, died c.890) was buried at Headleage, which is usually identified as Hadleigh. He may have built the original Saxon church at this site, traces of which were revealed in the churchyard to the south of the porch, in 1829 and in 1984. There is no real evidence, however, that Guthrum was the founder of the church. In the Domesday Book there is mention of a church at "Hetlega" being owned by Archbishop Lanfranc of Canterbury. The deanery, with a tall Tudor gatehouse in brick built just before the Reformation, next to the church, is also a Grade I listed building. Like its near neighbour, East Bergholt, Hadleigh was known during the 16th century for its Protestant radicalism. Rowland Taylor, a preacher from the town, and his curate, Richard Yeoman, were martyred during the reign of Queen Mary I. The Oxford Movement was said to have been founded in 1833 following a meeting in the deanery. Hadleigh United Reformed Church, situated off Market Place, was originally the town's Congregational Church, founded in 1688. It was rebuilt between 1825 and 1832, with seating for 1,000 and was restored in 1890–91. The current minister is Rev Bryn Rickards. The Baptist chapel, probably founded in 1814, was built in 1830 and had a gallery added in 1884. It was enlarged in 1875. The Salvation Army was established in 1889 a hall in Duke Street in 1920. St Joseph's Roman Catholic Church was built in 1966. The congregation was first established, in 1937, in a former corset factory which was destroyed by fire in 1964. In 1814, the Wesleyan Methodists purchased a C14th hall house in George Street and leased it to the Primitive Methodists, known as Ranters, in 1836. In 1848, the Wesleyans built a chapel on adjoining land and enlarged it in 1875. The chapel is now a Grade II listed home. There was also an Episcopal Mission Chapel built on Hadleigh Heath in 1878 and restored in 1891; it was disused by 1912. The former Kings Arms on Benton Street is a typical example of timber framing. The building, a pub for over 400 years, has sections that date to the 15th century. It was known unofficially as the "Old Monkey" and is still referred to by that name today. It is now a private residence and bed and breakfast. Suffolk is home to several manufacturers, including Jim Lawrence Handcrafted Home Furnishings, and the Hadleigh Maid chocolate company. Since 2009 Hadleigh has been the home of the Hellhound microbrewery. The Brett Works site, off Pound Lane, was for some years the home of Brett Valley Joinery and was later allocated by Babergh District Council as a potential site for a new foodstore. Supermarket giant Tesco has made a number of controversial proposals for the building of a store in the town. Their latest proposal, for development of the Pound Lane site, was rejected by the council in July 2011. The proposal was rejected again in September 2013. The Lady Lane Industrial estate is the location of Celotex Saint Gobain, the manufacturer of the insulation component in the cladding used at Grenfell Tower. The annual Hadleigh Show, first held in 1840 and also known as 'the May Show', is one of the oldest one-day agricultural shows in East Anglia. Organised by the Hadleigh Farmers' Agricultural Association, the show enjoyed 12,500 visitors in 2013. Benton End House, a Grade II* listed building on Benton Street, was originally a large medieval farmhouse. From 1940 it was the home of Sir Cedric Morris, artist and plantsman, who formed the East Anglian School of Painting and Drawing there. Students included Lucian Freud and Maggi Hambling. The Ansell Community Centre was set up in 2004 as a charity with the object of providing community facilities for the people of Hadleigh and surrounding area. It is a private company limited with six trustees. Membership of the ACC is open to anyone who is interested in the work of the charity. Currently there are over 30 members. The centre runs the digital cinema ("Hollywood in Hadleigh") and two lunch clubs. The ACC also organises community events such as "The Hidden Gardens of Hadleigh" and, together with churches in Hadleigh, some festivals throughout the year. The building is owned by the United Reformed Church. Hadleigh has a Non-League football club Hadleigh United F.C. who play at Millfield. The town is also home to Hadleigh Rugby Club (HRFC). Both the football and rugby club boast thriving youth and senior sections. The town's bowls and cricket clubs are among the oldest in Suffolk. The bowls club was founded in 1754. The cricket club is over 200 years old and pre-dates the Marylebone Cricket Club. Other sporting clubs include the Hadleigh Tennis Club, Hadleigh Hares (running club), Hadleigh Cycling Club. At Benton End Farm there is an equestrian centre and a paintball centre. Patrick Newell, the British actor who played spymaster "Mother" in the television series The Avengers, was born in Hadleigh. The town is the home of English poet and author Pauline Stainer. British extreme metal band Cradle of Filth were formed in Hadleigh. The artist Maggi Hambling was raised in Hadleigh and has one of her paintings displayed in St Mary's Church. The Guardian's architecture critic, journalist Jonathan Glancey, lives in Hadleigh. Caryn Franklin, the fashion designer, also lives in Hadleigh. Oswald Gayford, world record holder for long distance flying, in 1927, 1933 and 1938, was from Hadleigh. ^ a b "Census 2011: Parish Headcounts:Hadleigh". Neighbourhood Statistics. Office for National Statistics. Retrieved 28 October 2013. ^ "Contact Us » Babergh Mid Suffolk". www.babergh.gov.uk. ^ Geater, Paul. "Babergh and Mid Suffolk councils set to move to Ipswich in September". Ipswich Star. ^ Skeat, Walter (1913). The Place-Names of Suffolk. Cambridge: Cambridge Antiquarian Society. p. 78. ^ a b "Welcome to the Hadleigh Town Council website". GB: Hadleigh.onesuffolk.net. 22 September 2013. Retrieved 17 May 2014. ^ a b c Russell, Steve. "What was Hadleigh like 700 years ago?". East Anglian Daily Times. Retrieved 16 December 2018. ^ Woods, Margaret (1 December 2018). Medieval Hadleigh: The chief manor and the town. Lasse Press. ISBN 9781999775247. ^ "Listed Buildings in Hadleigh, Suffolk, England". britishlistedbuildings.co.uk. Retrieved 30 March 2013. ^ "East House, Hadleigh". britishlistedbuildings.co.uk. Retrieved 30 March 2013. ^ "Proposals for East House scrapped". Johnston Publishing Ltd. 19 March 2013. Retrieved 30 March 2013. ^ "Heritage Locations". www.transporttrust.com. Retrieved 1 March 2018. ^ Hadleigh Official Town Guide 2014, Local Authority Publishing Co. Ltd, p.10. ^ "What Are Listed Buildings?". britishlistedbuildings.co.uk. Retrieved 30 March 2013. ^ Dumville, David; Lapidge, Michael (1985). The Annals of St Neots with Vita Prima Sancti Neoti, The Anglo-Saxon Chronicle: a Collaborative Edition. Cambridge. ISBN 978-0-85991-117-7. ^ "Deanery Tower, Hadleigh". britishlistedbuildings.co.uk. Retrieved 30 March 2013. ^ Barry, William. "The Oxford Movement (1833–1845) (1911)". The Catholic Encyclopedia. New York: Robert Appleton Company. Retrieved 20 November 2008. ^ a b c d e "Parish: Hadleigh" (PDF). heritage.suffolk.gov.uk. ^ C. Sydenham (1967). The Story of Congregationalism in Hadleigh and district. ^ "Hadleigh, Suffolk URC". Hadleighurc.org.uk. Retrieved 1 May 2016. ^ D. French. History of Hadleigh Baptist Church (1815–1980). ^ Historic England. "Details from listed building database (1036788)". National Heritage List for England. Retrieved 23 January 2019. ^ Holden, Julie. "Is this Suffolk's sexiest place to stay?". Suffolk Magazine. Archant. Retrieved 30 March 2013. ^ "Hadleigh King's Arms summary from". Suffolk CAMRA. Retrieved 2 May 2016. ^ "Talking to Jim Lawrence". The Suffolk Guide. Retrieved 30 March 2013. ^ Evans, Katy (10 April 2006). "Freshly laid at Hadleigh Maid". East Anglian Daily Times. Archant. Retrieved 30 March 2013. ^ "Hadleigh Hellhound brewery". www.suffolkcamra.co.uk. 3 May 2013. Retrieved 21 January 2016. ^ Harris, Chris (7 January 2012). "Hadleigh: Tesco still wants a new store in town". East Anglian Daily Times. Archant. Retrieved 30 March 2013. ^ "Tesco's Hadleigh supermarket plans rejected again". BBC News. 18 September 2013. ^ "Celotex - UK PIR Thermal Insulation Manufacturers". www.celotex.co.uk. Retrieved 1 March 2018. ^ "Hadleigh Show". hadleighshow.co.uk. Retrieved 30 March 2013. ^ Gardening (2 February 2012). "Cedric Morris: The flowering of a great artistic talent". London: Telegraph. Retrieved 17 May 2014. ^ "About Us - Ansell Community Centre". www.ansellcc.org.uk. Retrieved 1 March 2018. ^ "Hadleigh United". Thurlow Nunn League. Retrieved 30 March 2013. ^ Gallagher, Marcus (9 April 2016). "Home". Retrieved 1 March 2018. ^ "Welcome To Hadleigh Bowling Club Website". hadleighbowlsclub.com. Retrieved 30 March 2013. ^ "Hadleigh Cricket Club – 213 not out". hadleigh.cricketclubwebsite.co.uk. Retrieved 30 March 2013. ^ "Hadleigh Riding Centre | Hadleigh | What to do in Suffolk". Thesuffolkguide.co.uk. Retrieved 2 May 2016. ^ Gunsmoke Paintball (13 December 2015). "Paintballing in Essex and Suffolk and Online Store". Gunsmoke Paintball. Retrieved 2 May 2016. ^ "Patrick Newell". Internet Movie Database. Retrieved 30 March 2013. ^ "Pauline Stainer – Author". bloodaxebooks.com. Archived from the original on 27 May 2013. Retrieved 30 March 2013. ^ "Suffolk tourist board embarrassed after metal band Cradle of Filth voted county's greatest icon". The Daily Telegraph. London. 5 January 2011. Retrieved 30 March 2013. ^ Bredin, Lucinda (18 May 2002). "Maggi Hambling – A matter of life and death". guardian.co.uk. London. Retrieved 30 March 2013. ^ Glancey, Jonathan (2 November 2007). "Food directory: Jonathan Glancey on organic shops and delis". guardian.co.uk. London. Retrieved 30 March 2013. ^ "My Home: Caryn Franklin, TV presenter". The Independent. London. Retrieved 30 March 2013. ^ Withers, Alison (28 February 2003). "Suffolk flight anniversary this year". East Anglian Daily Times. Retrieved 30 March 2013. ^ "Russell Swallow and the Wolf (Interview)". YouTube. 4 March 2013. Retrieved 9 December 2013. Wikimedia Commons has media related to Hadleigh. Wikisource has the text of the 1911 Encyclopædia Britannica article Hadleigh. "East Anglian Film Archive: "Hadleigh" search results – eafa.org.uk". Retrieved 1 May 2012.